Not long after the launch of Dior's Fahrenheit in 1988, the company had a deal: buy any two products in the line and get a duffel bag. A really great duffel bag, too. 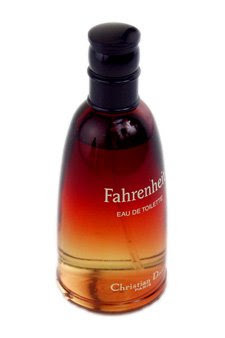 I kind of liked Fahrenheit, but I didn't love it, and yet I wanted that luggage, so I bought the EDT and the shower gel. I used the duffel bag until it was falling apart, and then Jim made me throw it away (we had better luggage, proper adult suitcases, by then). I used the shower gel until it ran out. I wore the scent a couple of times and then swapped it away. The trouble with Fahrenheit for me was that it was very strange, and I wasn't mature enough in 1988 to understand proper strangeness at the time. Hermes' Bel Ami had come out a couple of years before that, and my first reaction was shock and hatred in equal measure; it was weird, it was bitter, it didn't play nice. I wore the sample I'd gotten a few times, because I am stubborn, and each time my reaction was the same: "Jesus, how can they sell this?" A few years later I tried it again, and by that time I was ready for it; but I never did buy it, living off the new samples I got, and now (according to Luca Turin) it's been reformulated and so I never will buy it. There may be a (third) lesson in this. I'm used to strange in perfumery now. Not everything has to be immediately attractive. I bought Guerlain's Coriolan when it was launched, and that has many similarities to Fahrenheit and Bel Ami. I also bought the even stranger M7 by YSL the day I smelled it. But Fahrenheit is now on the list of things I won't ever buy, because it's been seriously, heavily reconstructed. Turin calls it "unrecognizable", and I don't know that that's exactly the right word, but maybe it is: the scent is drastically changed. In its old incarnation, it had a peculiar celery-like note in the top which threw me off. Underneath that was a broad, slightly bitter herbal-floral scent. It wasn't like anything else on the market at the time. The new version, or at least the version for which I have a sample (it's a year old, and who knows how many reformulations it's undergone? ), hews much closer to the mainstream of men's perfumery. I won't bother with a list of notes, because you can find that anywhere, and I don't believe such a list, anyway; it could be the original 1988 version, or it could be anything. What I smell now is a very typical men's scent. The strange top note, the one I came to think of as wonderful, is gone, and what remains is very synthetic, a citrus-herbal accord with some of that predictable freshness that used to come from Calone and now could be any of a number of related molecules. The middle is still somewhat floral in addition to being leafy-herbal, and it's not altogether uninteresting, but like the top it's contaminated with that synthetic freshness, since apparently every man has to smell as if he's just showered with seawater. The base is that ambered wood that practically everything available today seems to have, as if the continent had come to some sort of consensus on what the drydown of a men's scent ought to be, or as if the companies that manufacture the essential oils had made buckets of the stuff and were peddling it mercilessly. There isn't much in Fahrenheit to set it apart from most anything else you can find on the shelves, and that saddens me more than I expected it to. The bottle, at least, is still stunning: a parabolic chunk of glass shaded from light yellow-orange at the bottom to dark red-orange at the top. It looks like a desert sunrise frozen in time. I usually only post every Friday, but pop by on Sunday, why don't you? 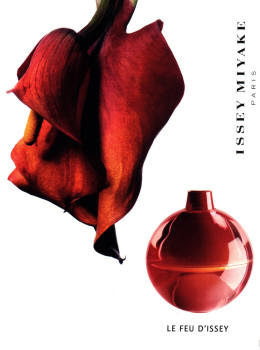 Last week I mentioned the love that fragrance mavens have for categories, using Le Feu D'Issey as an example: it's a baffling, near-uncategorizable scent, and I never did assign it a family, but I suppose it's an oriental, or, with its roses, a floral-oriental: the milky thickness and the ambery base notes make sure of that. Today I have another scent that defies easy categorization. Sarah Jessica Parker's Covet seems to occupy a number of spaces simultaneously. It mostly seems to want to be a fougere, that mainstay of men's perfumery, but at the same time it has a warm, glowing undercurrent (supposedly chocolate in the top note, though it doesn't smell like any chocolate I'd put in my mouth), and there really isn't any centre to the fragrance at all: it seems to transition from the fougere top to a woody, almost oriental base with nothing in between. As for the scent itself, I'm a little less enthusiastic. It's pretty good; it's much better than most everything a celebrity slaps her or his name on these days. 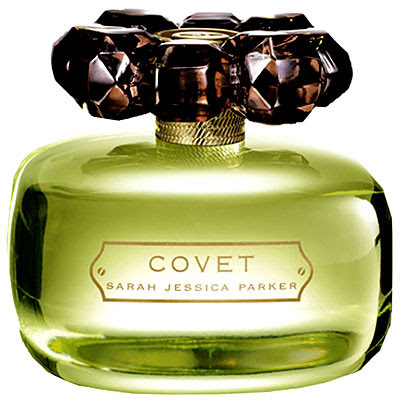 Obviously Covet took some time and money to make, and apparently Parker herself had a hand in it, which is almost unheard of but which is believable--the scent is offbeat, not one of the usual fruity-floral monstrosities that the celebs put their names to. It doesn't smell focus-grouped and safe. I like Covet, and I wear it and will continue to wear it. But I wish it were more interesting than it turned out to be. Top: Wet Greens, Geranium Leaves, Lemon, Chocolate, Lavender. Heart: Honeysuckle, Magnolia, Muguet, Michelia. Base: Musk, Vetiver, Cashmere Wood, Teakwood, Amber. Michelia is a relative of the magnolia. Despite all those flowers supposedly in the middle, there isn't really any floral presence to the scent at all. Any man could wear this and nobody would bat an eye. The bottle is a squat cuboid thing full of brightly chartreuse juice with a peculiar top--not even a cap, just a ring of dark-brown imitation topazes that clicks smartly onto the sprayer. Everyone seems to hate it, but I kind of like it. It doesn't resemble anything else on the market. Like the contents and like SJP, its public face, the bottle seems to be saying that it takes orders from no one. I thought about it and tormented myself for a little while, but I knew I was lost without it, so I bought it. Of course I did. The contents hardly even mattered (though they were tremendously interesting). And I wore the scent for a couple of years, and then I got tired of it, as I will, so I offered it to my friend Charlene, one of those fabulously brassy women who can wear pretty much any scent as long as it's big and showy, the kind of thing you can never imagine on a schoolteacher or a systems analyst. I had introduced her to Angel, which naturally fit her like a glove, and also Nicole Miller; I had given her my half-used bottle of A*Men when I tired of that, and also a full bottle (I had two) of Todd Oldham. (This is because I am an enabler.) You could never see Charlene wearing L'Eau D'Issey, but clearly she was the perfect recipient of Le Feu D'Issey, so I offered it to her, and she took it. And she wore it, too. A month or so ago she was in town and I asked if she still had it, and she warily said, "Yes, but you can't have it back!" No, I said, I just needed to borrow it so I could write about it. She kindly returned it to me for a little while, and I've been wearing it all week, but sparingly, because there isn't much of it left. You can't see the glass bottle inside the acrylic one, but you can sort of catch a glimpse of it if you peer through the bottom and hold it just so, and this is a nearly-empty bottle; there are a few millilitres left sloshing around in there, and when it's gone, it's gone. Le Feu D'Issey was discontinued not very long after it was launched: there was a half-hearted attempt to lighten it up for the terrified masses with Le Feu Light (in the same bottle but now in a pale, watery, un-fiery pink, above), but that didn't take, either, and now it's gone. Every now and then, the perfume manufacturers will attempt to invent a new category that their new fragrance is the first exemplar of. Nicole Miller called her first eponymous scent an "explosive aura-floral", and Giorgio Red was supposedly the first "fleuriffe chypre". (You may have noticed that neither of these categories stuck around.) But bone-deep fragrance lovers love a category: they like to be able to smell something and analyze it and think, "Oh, this is a green chypre, and it resembles Diorella" or whatnot. 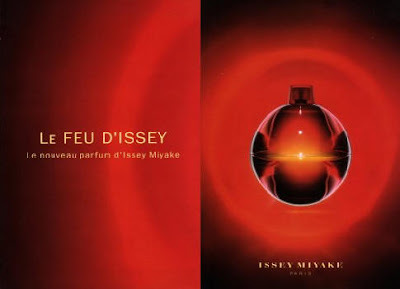 The thing about Le Feu D'Issey is that when you smell it, and not even for the first time, you're thinking, "God, what the hell is this?" Straight out of the bottle, Le Feu D'Issey is strange and compelling. It pulls you in two directions at once: it's simultaneously a fresh rosy floral and a thick, sweet brew which resembles nothing more than hot sugared milk with a pat of butter floating in it. Spices play peekaboo from time to time, and the drydown is warm and vanillic woody amber, but mostly what you have is roses floating in a bowl of hot milk. It is so odd, so unexpected; weird and comforting at the same time, perpetually jangling your nerves and then soothing them. If you should happen to get hold of some this stuff, let me give you a warning: Le Feu D'Issey does not go well with food. It has qualities that dominate your sense of smell, even late in the game: it makes you think that whatever you're eating has that same dense milky-creamy quality. Don't apply it before going out to dinner. 1) Revive Le Feu D'Issey. Build up to it: drop a few hints that the scent is returning, exactly as it was, none of these miserable reformulations that make no-one except the accountants happy, in that same spectacular bottle. Play it up. Make people really desperate for it to reappear. (Ads with a few more words in them would be a big help: the ad above is not going to do it.) Then launch it wide. 2) Release Le Feu D'Issey Pour Homme. Spend some time and money on it: make it a respectable, intriguing variation on the women's scent. Put it in an equally stunning bottle, maybe a blocky, rounded-off variation of an icosahedron. 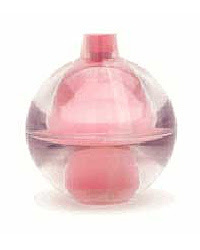 3) Every year, put out two limited editions, one for women and one for men, in recoloured versions of the bottle. Le Feu Vert D'Issey. Le Feu Lapis. Le Feu Blanc. Not just some cheap knockoff flankers, either; make them really good, desirable versions of the original. Put them on a schedule, like Beaujolais Nouveau, so that people can anticipate them; say they hit the shelves on September 8th, then disappear just before Christmas. 4) Finally come out with Le Terre D'Issey and L'Air D'Issey. I mean, if you're going to name your first two scents after two of the classical Greek elements, you might as well keep going. After writing about it, I wore it to work, where, at the morning meeting before the store opened, I was surrounded by delighted women sniffing me and declaring that I smelled amazing, that this was the sort of thing that they would buy for their husbands. We were sort of busy at the time and nobody asked me what it was called. What would they have thought if I had told them that its name was the not resoundingly masculine Anisia Bella? What would their husbands have thought if asked to wear something with that name? What if those men had put some on and then learned that it was marketed as a women's scent? Horror and consternation! Or so I would think. It usually isn't a good idea to buy something without having worn it at least once or twice, but if you were going to make an exception to the rule, I think this would be a good scent to do so with. Anisia Bella's perfumer, Aurélien Guichard (son of Jean Guichard, who had a hand in Obsession and made the sublime eighties scents Loulou and Montana Parfum de Peau), describes Anisia Bella as having "an overdose of anise", but he must be speaking proportionately, because Anisia Bella doesn't have an overdose of anything. It's the definition of a transparent scent: light, fresh, gauzy. It doesn't project at all. If I don't count Demeter scents, it's by far the lightest thing I own, even more so than such watery fragrances as Bulgari Eau Parfumée. Even the original Aqua Allegorias Herba Fresca and Pampelune have more body than this. Under a cold, crisp opening of citrus notes, the anise bursts forth, accompanied by just a little bit of something that I thought smelled like a freshly peeled carrot, but not quite: it took me a while to realize that what it smelled like instead was a freshly peeled parsnip (a botanical relative of the carrot), and that is a lovely thing to smell like. There isn't much development; Aqua Allegorias are made to be simple and straightforward. The middle of the scent is mostly that anise, accompanied by some vague nods at floralcy, mostly violet, and the base is an equally vague woody warmth. Anisia Bella, with its violet and anise, is suggestive of Guerlain's own Apres L'Ondee, though much simpler and lighter, of course. It lasts in a meaningful way for only two or three hours, but what nice hours they are! I can easily imagine someone going through an entire bottle of this over the spring and summer. Not me, obviously, because if I had to wear the same thing every day for six months, I'd go insane. 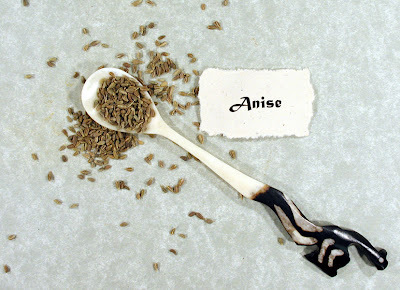 But if you fell in love with it and made it your signature scent--which could easily happen, if you love anise--you could really shower yourself with it: four or five spritzes sounds about right, and later in the day you'll probably want to dose yourself again, because it'll have vanished by then. A bottle wouldn't last very long at all. Just long enough for fall to arrive. Anisia Bella, if you should be interested in buying it, has been discontinued, like most of the Aqua Allegorias (Gentiana: toast. Lavande Velours: gone). It was launched in 2004 and cut from the lineup a year or so later, as I whiningly noted a couple of years ago before it finally occurred to me that I had no choice but to buy it online, a dangerous road that I was reluctant to head down, because I have no self-control when it comes to scents. So, discontinued or not, you can still get it: I got some at Imagination Perfumery for $23.99, and they still have it, but other places sell it, too, and just about as cheaply. Worth it! 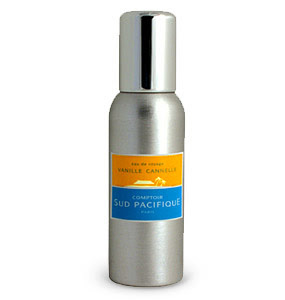 I notice that a couple of years ago I said I was saving a sample of Comptoir Sud Pacifique's Vanille Cannelle, but if that was ever true (I'm starting to doubt it), it got lost in the shuffle somehow, because I never did smell it. Until this week. I had been pining desperately for Perry Ellis 360 Black, which I had smelled in Ottawa a couple of years ago and instantly loved but had, unwisely, not bought. It plagued me, and I can't say why, but I wanted it. I found a website for a place called Imagination Perfumery, and their prices were surprisingly low (I shopped around); they had the very gift set I'd seen in Ottawa in 2006, and they were selling it for $34.99. I poked around their site for a while and had a tentative list of about ten things I wanted (one of which was a Mother's Day gift for my mom, a bottle of Jolie Madame by Balmain), but I kept putting off ordering, for no good reason except that I couldn't really justify spending that kind of money. • Perry Ellis 360 Black, because I wanted it, and lucky I ordered it, too; I went back to the website on Tuesday to get a picture of the gift set (100 mL spray, 7.5 mL pocket spray, deodorant, and shave balm), and they don't have it any more, which means that I apparently got the last one. Yay! • CSP Vanille Cannelle, something which intrigued me, at a ludicrously low price, at least two thirds off. • Balmain Jolie Madame, for my mom, who's been wearing it since 1974. I mean, she wears other things, too--with me as a son, of course she does, because you'd have trouble counting the samples and miniatures and bottles I've given her over the years--but Jolie Madame is her mainstay. • Lanvin Arpege Pour Homme, because the sample I had was intoxicating. • Guerlain Terracotta Voile D'Ete, because it's an iris-carnation-vanilla blend that sounded like something I'd enjoy, as I am mad about carnations (this review at the Scented Salamander tipped me over the edge), and if I didn't like it, it was inexpensive enough that I could just give it away. • Guerlain Mitsouko, because it was high time. My first impression of Vanille Cannelle was a bit of a disappointment. I think I had been expecting something bigger and stronger; what I got was a soft, creamy cinnamon with all the edges planed off. The opening of the scent smells exactly like the cinnamon of cinnamon toast; muted by the butter and coddled by the sugar, it's a ghost of the real thing. CSP's scents are not noted for their complexity or development, but Vanille Cannelle does develop, and in the most unexpected way. As the first hour goes by, the spice becomes sharper and clearer: it's exactly as if you were gradually focusing a movie projector on a screen, or as if someone were walking towards you in a thick fog. The core slowly emerges and, bolstered by some rather undefined spices (ginger, I think, and maybe cloves) and the molasses tinge of brown sugar, takes on the spine and the edginess I'd been expecting of cinnamon all along; the dusty bitterness, the slight sourness, and most of all the radiance. It's a marvelous transformation. After a few hours more, the cinnamon begins, slowly, to fade away, replaced (though never completely) by that rich and durable CSP vanilla. Twelve, fourteen hours later, that spice-tinged vanilla is still there on your skin, still beautiful. I don't know if I'd say that Vanille Cannelle is my new favourite CSP (because there are a lot of contenders; I own eleven), but I've been wearing it all week and I couldn't be happier. Naturally, as soon as "Perfumes: The Guide" was available, I ordered my copy, and naturally, I've been waist-deep in it for days. You haven't heard? 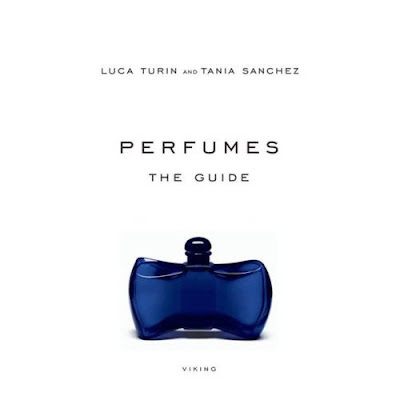 "Perfumes" is a book by scent iconoclast Luca Turin and his wife, Tania Sanchez. Beginning with a little collection of essays about perfumery, the book then devotes 300+ pages to capsule reviews of well over 1000 commercially available scents. If you are reading this blog, then you require this book, and no two ways about it. Go order it if you haven't already. I got it from Amazon.ca for $17.61, over $10 off the list price. You really have to own this. The first thing anyone is going to do with such a book is look up their favourites and see how they fare. The authors, no doubt about it, have a pair of noses on them, and a big batch of opinions, and they're not afraid to use these tools. I was reminded more than once of Pauline Kael, whose film criticism was indispensable to any film lover: I always felt that, even if I disagreed with her, she still had something to say that was worth listening to. Like Kael (who unaccountably adored trifles such as "Club Paradise"), Turin and Sanchez have some rather baffling pets; much has been made of their love of, of all things, Tommy Girl. I'll allow them that, if they want, though I don't think much of the scent, but perhaps there is more to it than I see. However, they champion some indefensible things as well: they allot Gucci Rush five stars. Five stars for that gaudy trash, that heap of glittering olfactory rubble! And of course the converse is true: they inevitably savage some things that I love. I can't necessarily defend my addiction to Midnight Poison by Dior (though I've tried), but I think it deserves better than to be called "a confused, meretricious, skimpy, trivial, borderline-insulting confection." I'm baffled that the authors didn't, as they so often do, simply interpret it as a men's scent, by which light, I think, it does rather well. Also, if Tania Sanchez thinks that Spellbound is "powerfully cloying and nauseating", then all I can say is, she's doing it wrong. I was glad to see that I wasn't some kind of philistine by disliking practically everything I've ever smelled by Creed, because Turin and Sanchez' opinions line up pretty nicely with my own. I don't understand Creed's reputation; is it because their stuff is expensive and they've been around for two hundred and fifty years? Green Irish Tweed is as good as Turin and Sanchez say, and I also love Bois du Portugal, but most everything else seems cheap and pointless, particularly the hateful Virgin Island Water, and Original Santal and Original Vetiver, both of which get one star in "Perfumes", and deservedly so. I couldn't even be bothered to review them: every time I dab on one of my samples of them with a mind to writing about them, I think "Ick" and my brain pretty much stalls there. I think that leads to the most important thing that people who read this book closely are going to take away from it. They'll learn to trust their own noses, to love perfumes because those perfumes are good and for no other reason: cheap scent is not necessarily bad scent, and high cost is no guarantee of quality. Turin and Sanchez give thumbs-up reviews (or at least neutral ones and not outright pans) to, among other things, Stetson by Coty and Believe by Britney Spears, and one-star savagings of such expensive perfumes as Le Labo's exclusive Ambrette 9 ("a costly mess") and L'Artisan Parfumeur's Mechant Loup, which I've repeatedly tried and failed to love ("Bad wolf? More like wet dog"). Something else I hope most readers get from the book, something related that I've been trumpeting for ages, is that they shouldn't be afraid to browse across the aisle. Most men's and women's scents are that in name only: what really counts is how they smell, and a man shouldn't be afraid to wear a scent just because it happens to be in the women's section of the perfume department. In a better world, we'd be able to buy blind, because what matters, all that matters, is that a particular scent smells good and brings us pleasure. The writing is generally a lot of fun: each scent is suffixed with a two-word description, often very straightforward ("green chypre", "woody citrus", "roasted sweet") but as often snarky, sometimes to the point of outright, and delicious, cruelty ("sad florist", "medicated treacle", "hideous oriental"). The reviews range from a single sentence to a full page, and vary in style from character assassination through chemical analysis to dreamy adoration, exactly right for an art form so volatile and evanescent. Writing on perfumery, particularly reviewing or criticizing fragrances, tends to be vague, for the very reason that we don't have a big vocabulary to discuss scent. The authors of "Perfumes", particularly Turin, go some way towards remedying this with very specific and sometimes technical discussions of what exactly is in a fragrance to make it smell the way it does, and most readers are going to learn a lot about the chemistry and the business behind the fragrance industry. There's still more than a little nebulosity about some of the writing, though; when they say, for instance, that Eau du Navigateur smells "very dated today", what does that mean? I've been racking my brains trying to figure it out. Does it smell very early-eighties to the authors (it doesn't have anything in common with other scents from that era to me), or is it somehow stodgy or old-fashioned (it isn't)? This might be a quibble, though: a lot of the writing is admirably clear and direct. I couldn't agree more with Sanchez when she says of Dior Higher Energy, "I've run out of things to say about these horrible sporty masculines." I think we all have. One of the most interesting, and depressing, things about the book it how clear it becomes that practically every fragrance seems to get reformulated sooner or later. When Bel Ami by Hermes was launched in 1986, I hated it; it was bitter and strange and unlovable. 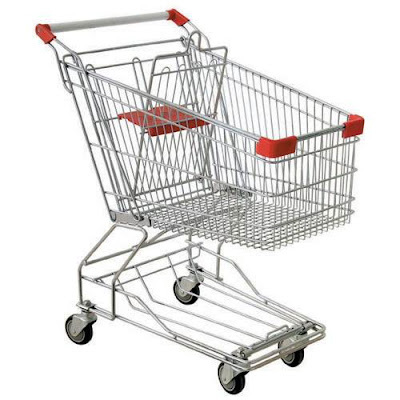 I couldn't even understand how it had ever made it to market. A couple of years later, on revisiting it (which I always do with things I hate, for some perverse reason), I was ready for it; it hadn't changed, but I had, and suddenly I got that baffling strangeness, that brilliant, acrid sharpness that suffuses the whole thing. Now, Turin says that it's been remade (due to new regulations about what can be put into a fragrance), and while I'd been mulling over buying a bottle for literally years now, I think I have to put it in the category of things that are better remembered than re-experienced. This is an odd thing to say, I think, but the book doesn't work particularly well as a book. It seems like a subject far better suited to a searchable database. I spot a listing for a perfumer or a house I don't know, say Mona di Orio (who will not want to read this book), and want to read what they have to say about all her fragrances, and I can't do it, because the listings are by alphabetical order of the perfume names and nothing else. Clearly we're spoiled by instant access to everything in the world, but this is the sort of book that invites searching of various sorts, exactly the kind of searching that's difficult to accomplish with a book, unless it's supplied with a lot of indices. There's only one index in this book, for the various ratings (you can easily see which scents earned five stars and which only one). It isn't enough. I should be able to look up every scent that Olivia Giacobetti (the genius behind my beloved Safran Troublant) has had her hand in, so that I can find more by her. I should be able to find all the Yves Saint Laurent scents together (a house which has some baffling omissions in the guide--M7 and Y and Opium are discussed, of course, but not In Love Again, which made a big stir, nor Nu nor Yvresse). I should be able to find everything that the authors classify as, say, an aromatic fougére, or "soapy", a word they're fond of (and with good reason). I don't think this is nit-picking. For a book on this scale, a book which wants to help people find and fall in love with scents and make smart choices from the thousands out there, such indices are absolutely essential. Perhaps in the second edition. We can hope.